We’re joining the Berks County Rocks! Facebook initiative. We’ve hidden rocks at some of our client and project sites and we’re tracking their journey. If you find one, bring it to our office and receive a free Taste of SSM. This issue provides some clues to the first locations! We’ll be posting updates on our website GIS Map as the rocks are found. Founded March 11, 1752, Berks County is home to rich farm land, industry, beautiful parks, entertainment, and 5 higher educational institutions. In addition to deep historic roots and a place on the Monopoly board, Berks County boasts many notable connections including Pulitzer Prize winner John Hoyer Updike, NASCAR Driver Kenny Brightbill, Philadelphia Phillies pitcher Chad Billingsley, American Pioneer Daniel Boone, actor Michael Constantine (My Big Fat Greek Wedding), Grammy Award-winner Dave Cullen, Professional Football Player John Henry Gilmore, Reality TV stars of Jon & Kate Plus 8, and artist Keith Haring. From the plentiful Ontelaunee Orchards and chocolate manufacturers like R. M. Palmer, to prominent manufacturers like East Penn Manufacturing Co., Inc. and Carpenter Technology, to Jazz Festivals and renowned bike races, Berks County has many hidden treasures waiting to be discovered. We’re connected to the Berks County community. 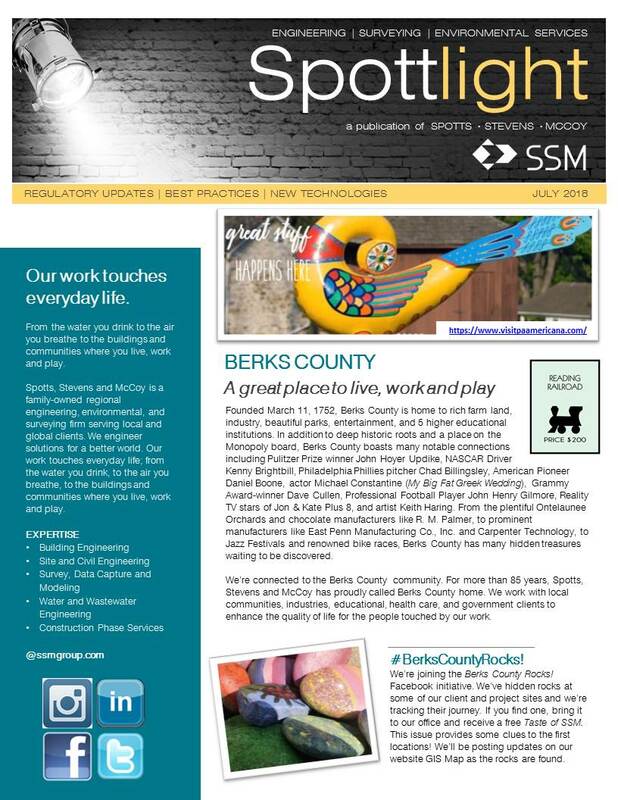 For more than 85 years, Spotts, Stevens and McCoy has proudly called Berks County home. We work with local communities, industries, educational, health care, and government clients to enhance the quality of life for the people touched by our work.